Bus operator Stagecoach has said ALL services in and out of Peterborough are delayed today due to the extreme traffic congestion caused by roadworks. All buses are delayed by at least 40 minutes Stagecoach have confirmed. 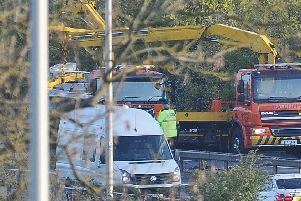 Andy Campbell, Managing Director of Stagecoach East, said: “The Highways Agency has closed the slip road onto the A1M meaning that anything going south from Peterborough now has to go through Yaxley. “Because of this there are severe delays affecting the 6, 46, 61 and B services. Our buses use the same roads as everyone else which means we also have to work through the same delays. “Unfortunately there isn’t an alternative route without diverting the buses which would increase the journey time. We have asked the council whether they can change the traffic light settings at the Yaxley crossroads in the meantime to try to speed up the journey time.